In less than three hours from New York City, you can be on a sunny beach with no care in the world. Welcome to Turks and Caicos, the archipelago of 40 coral islands in the Atlantic Ocean. Travelers from around the world flock to this chain of islands for the white sand beaches, clear azure water and welcoming island vibes. The island is packed with luxury resorts, shops and restaurants and has water adventures galore, from scuba diving a dramatic 2,134m underwater wall off Grand Turk Island or taking a private boat to Iguana Island. So if you’re looking for an easy escape from the chilly weather in New York, this may just be your ticket to sunnier days. Picture this… the warm sun beating on your skin, the sound of soft gentle waves breaking in front of you and the sight of miles of aquamarine waters right in from of you. 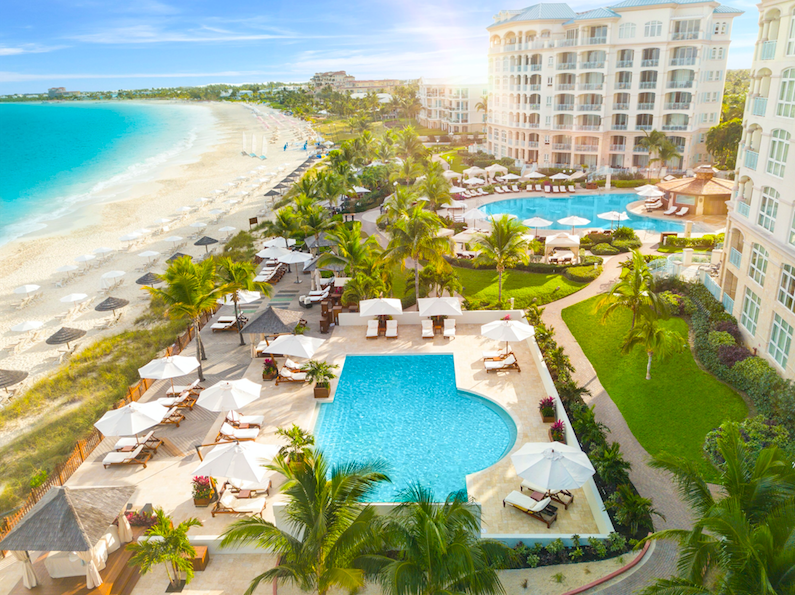 Combine that with a delicious watermelon margarita and white-glove service and now you know what it feels like to be at the oceanfront Seven Stars Resort & Spa after a long winter. The resort recently completed a $12 million renovation for a full redesign of the guestrooms and suites; addition of a second pool; and a spa and fitness center expansion. 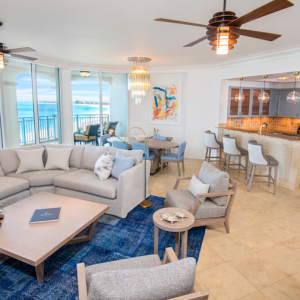 Throughout the resort’s 167 suites and open-air lobby, a carefully curated collection of stylish leather seating and sophisticated furnishings in richly colored, nature-inspired teals, blues, tans and browns connect guests with the area’s pristine beaches and famously tranquil waters. Not to mention the breath-taking views and impeccable service, you’re truly in for a treat! This magical island has something for everyone, including unique tours and activities. Cruise along the Caribbean coast and enjoy the epic sunset on a private luxury boat ride with Island Vibes Tours. The cruise starts with your tour guides picking you up at your resort, and then the fun begins! 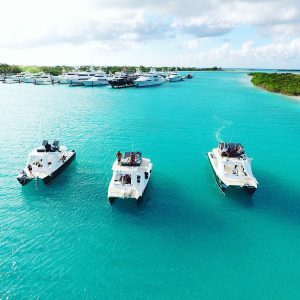 With a full bar stocked and island music playing, you’ll have the option of snorkeling, relaxing on the rooftop lounge, jumping off the top of the boat or taking a go at the 12 foot rooftop slide. The boat will make stops when requested and will dock at Iguana Island for a little bit of exploration. Sky Pilot Parasailing is another popular island tour guide and if you’re looking for a little adrenaline rush, parasailing may be for you! Fly above beautiful Grace Bay for the ultimate view of paradise, you’ll have a smile on your face for hours post flight. Turks and Caicos restaurant scene has grown into a burgeoning hot spot for foodies. The island is well known for it’s fresh local seafood and delicious cocktails. If you wish to stay on property at Seven Stars Resort & Spa, you can’t go wrong with their signature restaurant, Seven. There you’ll enjoy an exceptional culinary experience blending island spices, fresh local seafood, and an array of international flavors in this award-winning gourmet restaurant. 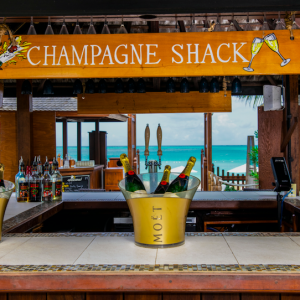 The property also features a champagne shack (yes, please), an open-air dining restaurant called The Deck and private beach-side dining for a romantic evening. If you’d like to venture off-property, opt for a 20-minute car ride to Amanyara, you won’t be disappointed. Set between a marine national park and a nature reserve, Amanyara is a peaceful Caribbean retreat graced by white sand beaches. Guests can dine either indoors and air-conditioned or outside on the central pond and will be in awe of the intricate architecture in either location. Freshly caught seafood – from red snapper to tuna and grouper – is the focus, complemented by organic produce from the resort’s aquaponic vegetable garden. The Spa & Boutique at Seven Stars Resort was a part of the recent renovation with newly added manicure and pedicure stations and a meditation lounge offering a quiet and soothing space for guests. Dedicated to the promotion of overall wellness both inside and out, the spa offers a menu of services and treatments designed to help guests relax, rejuvenate and restore. Reawaken your body after the winter with the spa’s menu of unique massages, facials, body treatments, manicures and pedicures. 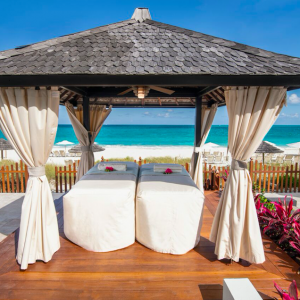 Opt for a beach-side massage in the serene hut overlooking Grace Bay beach or totally indulge in the all day Crème de la Crème spa package. You’ll begin with a 50-minute Swedish massage, followed by a customized Yonka facial and pampering of your hands and feet with a manicure and pedicure. Relaxation at its best!